Eagle Summit 2018: What's New? You are here: American University Communications & Marketing News Eagle Summit 2018: What's New? 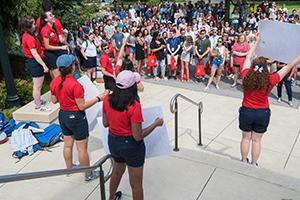 Over six sessions in June and July, hundreds of incoming first-year students flooded the American University campus to participate in Eagle Summit. The two-day orientation gives new Eagles the opportunity to get to know the AU campus and culture, spend the night in a residence hall, and connect with their classmates before the fall semester begins. From the hearty welcome participants received in the amphitheater, where they first met their orientation leaders, to programming centered around social issues, diversity and inclusion, academics, and more, attendees - along with parents and guests - were immersed in all things AU. "Our goal with orientation is for students to feel comfortable being on campus," said Jennifer Johnson, director of orientation, transition, and retention. "The budding friendships are a huge piece, spending facetime with academic advisors, and making sure they feel ready for what their course schedule holds." Participation in an Eagle Summit is not required, but Johnson said last year just over 94 percent of the incoming class attended. And though orientation occurs in a similar format every summer, Johnson and her colleagues consistently use feedback from students and guests to ensure sessions are closely geared toward incoming students' wants and needs. "This year, we really made it a point to focus the first day of Eagle Summit to really be about the student as a person and as a member of our AU community," Johnson said. This was reflected in the day one programming centered on life in the residence halls, dining, community standards, campus safety, and diversity and inclusion initiatives. Day two focused on the attendees' academic lives. "A lot of times students come in, and they're thinking about classes and the rigor rather than, 'I'm going to be sharing a bathroom with people,'" Johnson said. "So day one was focusing on them as a whole student and day two was about academics." One of the most significant changes in recent years goes into effect this year: the first-year advising program. As a development brought about by the RiSE Initiative, incoming students will all have first-year academic advisors who are also their AUx1 instructors. This means first-year students will have consistent, weekly contact with their advisors. This frequent contact will foster close, meaningful relationships, enabling advisors to recognize and respond to individual student needs. This year's incoming first-year students met their advisors for the first time at Eagle Summit, where they learned more about the new advising experience and reviewed their course schedules. Also new this year: an online orientation, intended to be complementary to the Eagle Summit experience. The 30-40-minute web-based application drives home many of the topics students discussed during their two days on campus. The in-person experience, while informative, can be overwhelming, Johnson explained. The online orientation provides the opportunity to fully absorb the information. After the June and July Eagle Summits wrapped up last week, Fanta Aw, PhD, vice president of campus life and inclusive excellence, celebrated the success of six sessions of comprehensive programming. "Eagle Summit is a time for incoming students to learn about AU's values, our expectations, and our commitment as an institution," said Aw, who is also Hurst Senior Professorial Lecturer at SIS. "Students and families had an opportunity to establish authentic and meaningful relationships and to begin to connect with their new home. The program was very well received, and it truly took a village." For current AU students who look back fondly on their Eagle Summit experience, the orientation leader program offers the opportunity to relive it. "Our orientation leaders are the hallmark of our program. Research has shown that learning from a peer experience is much more effective than having staff speaking to students," Johnson said. "Especially about social issues." Orientation leader applications will open in late November or early December and are generally due when students return to campus after winter break. The full process includes an application, GPA verification, a group interview process, and an individual interview process. "It's a highly competitive position and a pretty substantial time commitment," Johnson said. "We tend to see people apply for the position because they had such wonderful Eagle Summit experiences themselves."